BOULDER, Colo. — A spacecraft that will test the unique attributes of a high-performance, nontoxic, "green" fuel on orbit is being prepped for launch in 2017. NASA's Green Propellant Infusion Mission (GPIM) is set to blast off from Florida's Cape Canaveral Air Force Station next year aboard SpaceX's Falcon Heavy rocket. The launch is part of the Air Force's Space Test Program 2 (STP-2) mission. The U.S. Air Force Research Laboratory (AFRL) at Edwards Air Force Base in California developed the new propellant, which is a hydroxyl ammonium nitrate fuel/oxidizer mix called AF-M315E. This fuel is 45 percent denser than hydrazine, meaning more of it can be stored in containers of the same volume. The propellant also offers nearly 50 percent higher performance for a given propellant tank volume compared to a conventional hydrazine system, the researchers said. GPIM is a technology demonstration mission made possible by NASA's Space Technology Mission Directorate, and it draws upon a government-industry team of specialists. "The spacecraft is finished and in storage," said Chris McLean, principal investigator for GPIM at Ball Aerospace & Technologies Corp. of Boulder, Colorado, which is the prime contractor for GPIM and is leading the demonstration of the alternative fuel for future space vehicles. "We're now writing the flight manuals and flight procedures … all the detailed documentation that is required to fly the spacecraft," he added. McLean said that, as of right now, GPIM is headed for a March 2017 liftoff. "During the 13-month test period in orbit, we'll be running basically four series of experiments with the propulsion," he told Space.com. GPIM's on-orbit test of the "green" fuel — whose actual hue is closer to peach — will make use of a set of thrusters that fire in different scenarios to test engine performance and reliability. Planned on-orbit maneuvers also include attitude control demonstrations, spacecraft pointing and hold, inclination change and orbit lowering. A technician works on NASA's Green Propellant Infusion Mission (GPIM) at Ball Aerospace, the prime contractor for the spacecraft. The green propellant propulsion subsystem was built by Aerojet Rocketdyne in Redmond, Washington. GPIM's propulsion hardware uses a catalyst technology pioneered by Aerojet Rocketdyne that breaks down the green fuel, generating gaseous products that come out the engine nozzle to provide thrust. "That breakthrough in catalyst technology enabled these thrusters to be developed," McLean said. The American-made green propellant burns hotter than hydrazine, so different metals than those traditionally used were incorporated into GPIM's thrusters to withstand the high temperatures. McLean said the green propulsion system will fly aboard the tried-and-true Ball Configurable Platform 100 spacecraft bus — a cost-saving approach. Before GPIM takes to space next year, a number of milestones are on the calendar. McLean said work is underway to prepare for GPIM's arrival at NASA's Kennedy Space Center, which is next door to Cape Canaveral, and over to SpaceX's launch facilities. Dry runs of green-propellant loading are in order, he said. "This is the first new fuel there since the 1970s," McLean said. So there are efforts underway to get everyone involved more familiar with the fuel, handling requirements and other procedures, he added. The processes that are developed with GPIM in Florida will work at Vandenberg Air Force Base in California, Wallops Island in Virginia and other launch sites, McLean added. NASA's Green Propellant Infusion Mission (GPIM) will demonstrate an alternative to traditional hydrazine fuel, which is highly toxic and corrosive. Steve Jurczyk, associate administrator of NASA's Space Technology Mission Directorate, said that developing and using green propellant technology not only increases protection for launch personnel and the environment but also offers the potential to reduce space mission price tags. If GPIM achieves its goals, the mission can spearhead widespread use of the fuel on future NASA and commercial missions, he said. GPIM team co-investigators are based at multiple NASA research centers and the AFRL, with additional mission support from the U.S. Air Force Space and Missile Systems Center at Kirtland Air Force Base in New Mexico. The GPIM effort is managed by NASA's Marshall Space Flight Center in Huntsville, Alabama. McLean said that NASA, the Air Force and industry participants formed an impressive and very successfully integrated team. 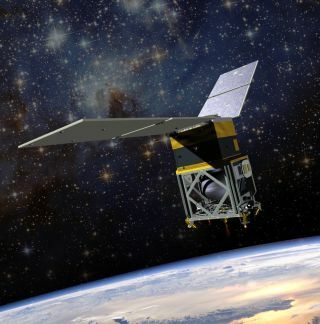 The GPIM mission, he added, will showcase the benefits of green propellant and help to improve spacecraft missions in Earth orbit and beyond. Leonard David is author of "Mars: Our Future on the Red Planet," to be published by National Geographic this October. The book is a companion to the National Geographic Channel six-part series coming in November. A longtime writer for Space.com, David has been reporting on the space industry for more than five decades.Follow us @Spacedotcom, Facebook or Google+. Originally published on Space.com.